THE Birmingham Canal Navigations Society is organising two Explorer Cruises thus continuing to encourage the use of the less travelled parts and to discover the pleasures of the little used canals of the northern BCN. The first one will take place from the 18th to the 25th May and the second one from & 15th to the 23rd June 2018, Stuart Sherratt tells us. Both Explorer Cruises will take a similar route, with boaters meeting with the organisers on the Friday evening at Wolverhampton at an informal gathering to receive the itinerary and discuss the cruise.The Bradley workshops will be visited on both cruises along with other guided walks, talks and social evenings. Keith Gudgin's photograph shows some of the boats taking part in a previous Explorer Cruise. For the May cruise the stop for the night of the 19th is at Pelsall Junction (0 locks), Sunday 20th Longwood Boat Club (0 locks), Monday 21st Moorcroft Junction (9 locks), Tuesday 22nd Walsall Town Basin (0 locks), Wednesday 23rd Wednesfield (8 locks), Thursday 24th Tipton (0 locks), Friday May Titford (6 locks). 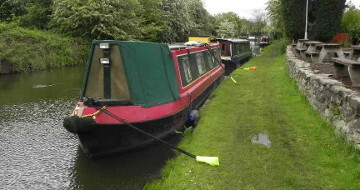 For the June cruise the stop for the night of Saturday 16th Pelsall (0 locks), Sunday 17th Anglesey Basin (0 locks), Monday 18th Longwood Boat Club (0 locks), Tuesday 19th Moorcroft Junction (9 locks), Wednesday 20th Walsall Town Basin (0 locks), Thursday 21st Wednesfield (8 locks), Friday 22nd Tipton (0 locks), Saturday 23rd Titford (6 locks). The Bradley workshops will be visited on both cruises along with other guided walks, talks and social evenings.